SEDA HOSTS A VAriety of events, talks and conferences each year. below is a short description of some of our recurring events. Keep an eye on our upcoming events to see what's on soon. Our Green Drinks happen regularly in either Glasgow or Edinburgh, and have even been known to pop up in Ayr and Dundee in the past. They usually take a rather informal format, with between one to three speakers giving short ten to fifteen minute presentations on a chosen topic, PechaKucha style. There are complimentary drinks included in the price ticket, and discounted tickets for SEDA members. Always an interesting evening, and a great way to share information. Howard Liddell OBE was a co-founder of SEDA. When he died in 2013 he was working on a book, "Eco-Max”, about pioneers of ecological design and their legacy. In 2015 Howard’s widow, Sandy Halliday, gave SEDA's first Howard Liddell memorial lecture on this theme and in 2016 SEDA hosted the second event, focusing on the life of Rachel Carson. In 2017 we showed a screening of the multi-award winning film: A Plastic Ocean. The screening of A Plastic Ocean followed a short talk on the life and legacy of Barry Commoner – a founder of modern ecology and one of its most provocative thinkers and mobilisers. The talk presented Commoner's Four Laws of Ecology and his key concerns about land, air and water pollution. For more information, and to book your tickets now, click the link below. 2017 we headed to The Engine Shed in Stirling – Scotland's new building conservation centre. Inspired by the venue, this year's theme was Conservation / Restoration / Retrofit. With a series of presentations on Heritage and Conservation of Turf Building from Iceland, Earth Plasters, The Pagoda, Kew Gardens (Austin Smith Lord), Restoration of Glasgow School of Art & Library (Page Park), Hab-lab + Under One Roof (John Gilbert Architects) and Woodside High Rise Enerphit Project (Collective Architecture) this was followed by a dinner, our AGM and a walking and cycling tour of Stirlingshire. A jam packed weekend, with a Photography Competition thrown in, it was a great weekend. 2016's annual conference and AGM was hosted by the dynamic Comrie Development Trust in Perthshire. 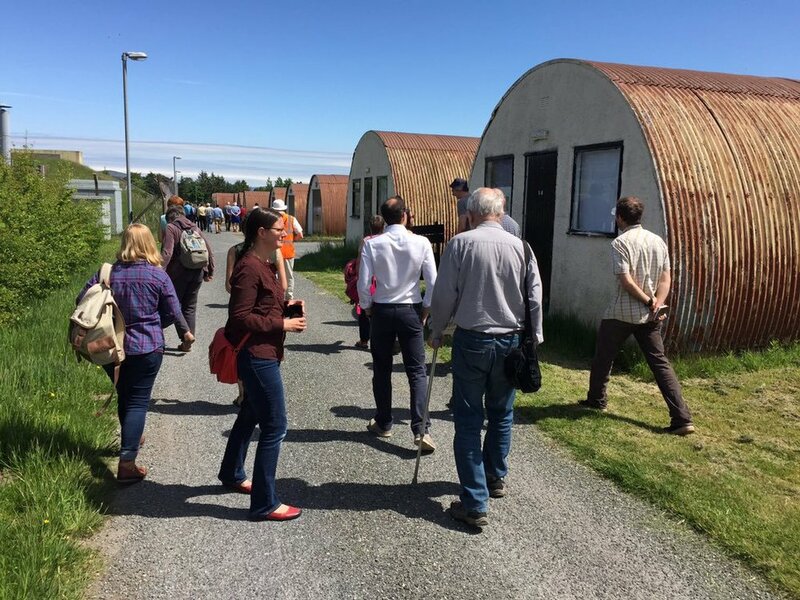 Under the working title of Small Buildings, Small Footprints, we brought together a range of fascinating speakers and tours with the meerkats and wild cats at Auchingarrich wildlife park and finding eco features in a WWII prisoner of war camp. With presentations from Assemble, Bernard Planterose on Hutting: a New Horizon for Small Buildings, A+DS – Cultybraggan Camp & Materials Library, BTE Scenic Routes – Viewing Tower at Loch Lomond, Gav Murray + Sean Douglas – Scenic Routes Caledonian Canal, Nick Thomson about the history of corrugated iron buildings, the role of early prefabrication, its place in the rural vernacular and influences on recent work by Rural Design and Neil Sutherland of MAKAR. 2015 Power down or power up? SEDA's 2015 annual conference and AGM, was held around Creetown and Galloway with an exciting programme of speakers and visits considering weather its best to 'power up' a community or 'power down' our needs and demands. Turner prize nominees Assemble joined us to talk about Loch Arthur Campbell Community's new organic farm shop/restaurant at Beeswing, with additional presentations on Tongland Hydro Power Station's Visitor Centre and tour of the building. We also had Andrew Ward talking about the work of the Creetown Initiative, Nic Coombey about his work with the Galloway and South Ayrshire UNESCO Biosphere project, and Sam Booth, who designs and manufactures timber "eco pods", as featured on TV in George Clarke's "Amazing Spaces". The SEDA Research Conference is an annual event in which practitioners and academics showcase their latest research or project led investigations. The conference focuses on a variety of themes that have an incline towards environmental topics. Past conference presentations have come from academics in the field of architecture, energy and sustainability. Practitioners presentations focus around lessons learnt in past projects or the research and analysis taken to solve a variety of client problems. New for this year the conference will include a group session dedicated to connect academics with practitioners to take advantage of members expertise for future funding streams and collaboration. The ‘Krystyna Johnson Award’ was re-launched in 2012 to encourage second year architectural students to bring ecological thought to their work from the outset. Each of the five Scottish Schools of Architecture promotes one project in their curriculum for consideration and awards are granted to each School. All five winners are presented in the exhibition, usually shown at The Lighthouse.